For the core of our plugin we use an additional framework called “FavPress”. FavPress is separated into an additional plugin. 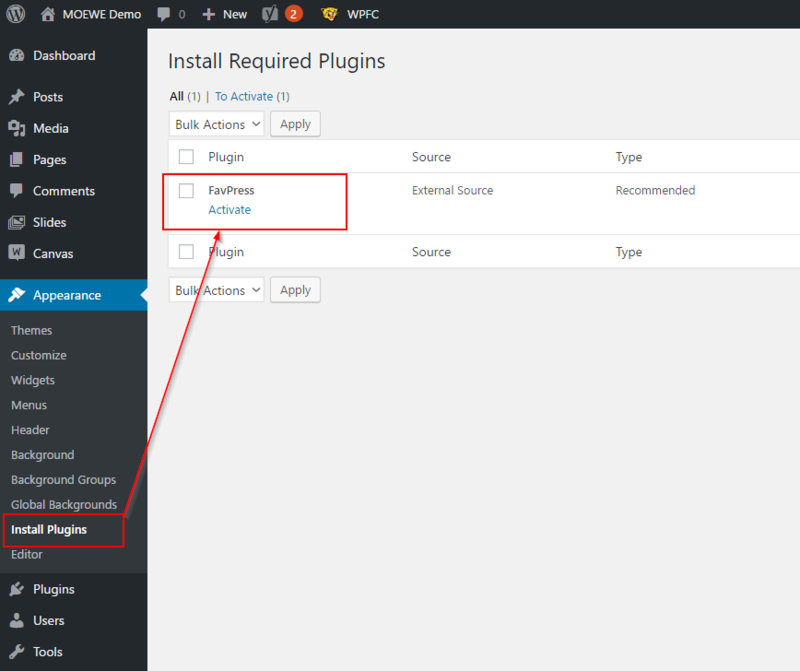 When activating one of our plugins it should ask you for installing FavPress. If this still doesn’t work, please upload and install FavPress manually from here. If this still doesn’t work, please contact us. For the core of our plugin we use an additional framework called “Vafpress”. Vafpress is separated into an additional plugin. When activating one of our plugins it should ask you for installing Vafpress. If this still doesn’t work, please upload and install FavPress manually from Github. If this still doesn’t work, it would be nice if you can create and send me login credentials to your site (use the contact form for this). Login as demo user to view the user specific sliders. © 2019 MOEWE Demo. All Rights Reserved.